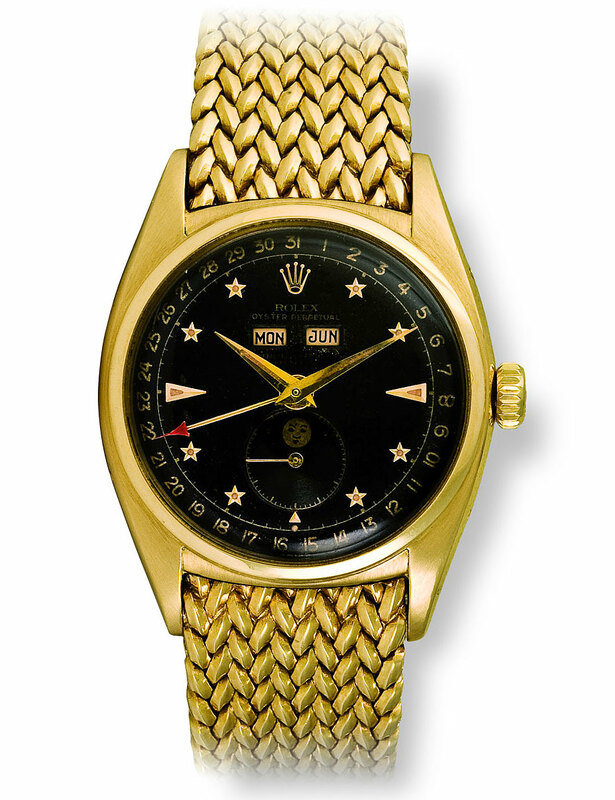 This is an extremely rare Rolex that is stunningly beautiful. It's current value is around $150,000. 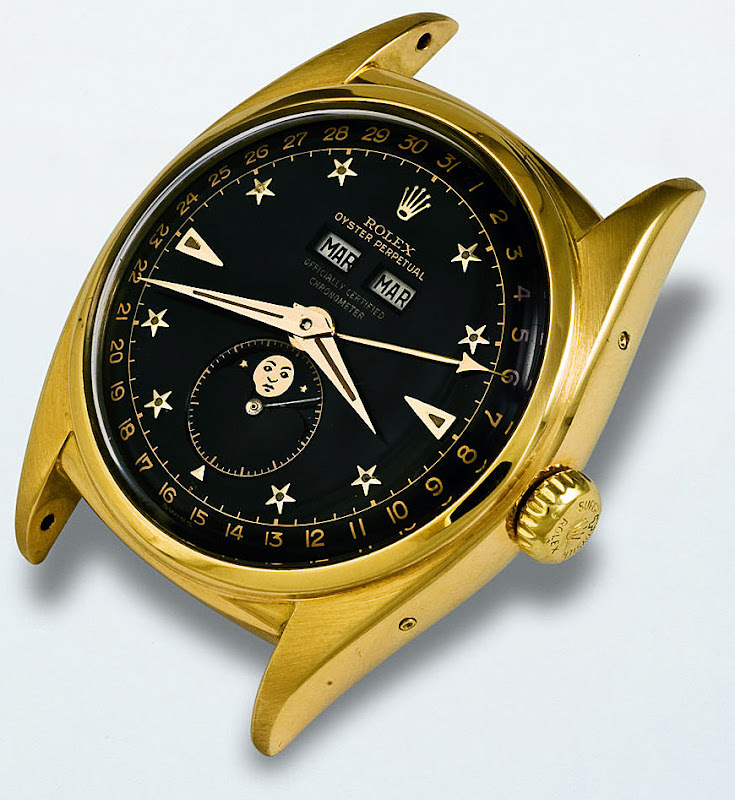 The reference 8171 was the first complicated Rolex Moonphase model Rolex ever made. 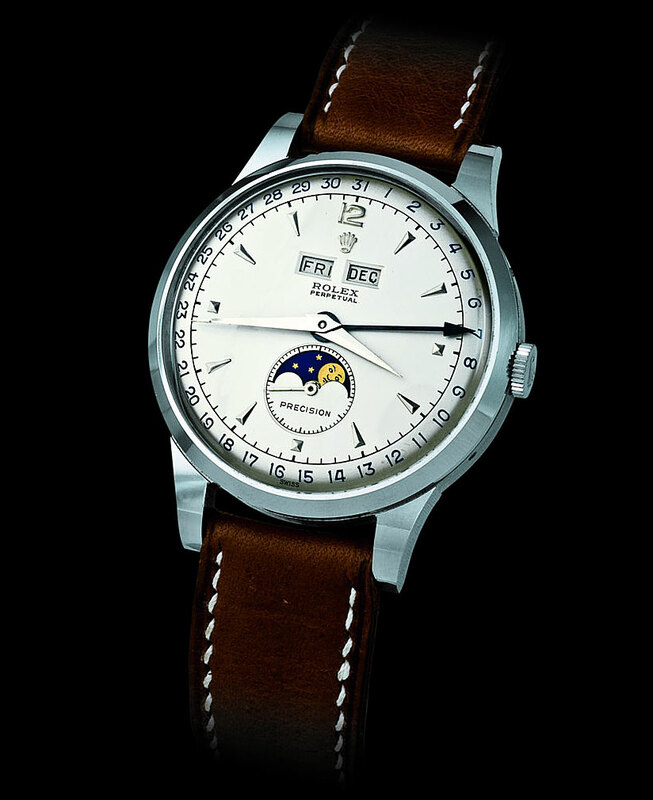 Unlike the 6062 Oyster Moonphase (pictured below) which came after this one, the 8171 was not an Oyster and thus not waterproof. The 6062 was 36mm, and the 8171 was a little bigger at 38mm. The current value of this watch is $150,000. This watch is unusual because it has a red arrow date indicator which I think is a nice design detail. Everything needs a touch of red. Although the Black dial 6062 moonphase with the star indices is the rarest, I though I would include the silvered dial so you could see what it looks like. This Rolex moonphase has a blue arrow tip indicator on the tip of the date hand just like the red one above it on this page. I thought I would include this watch since it has an original riveted Oyster bracelet. I have also seen examples of the 6062 with a Jubilee bracelet but there is not one in the book. 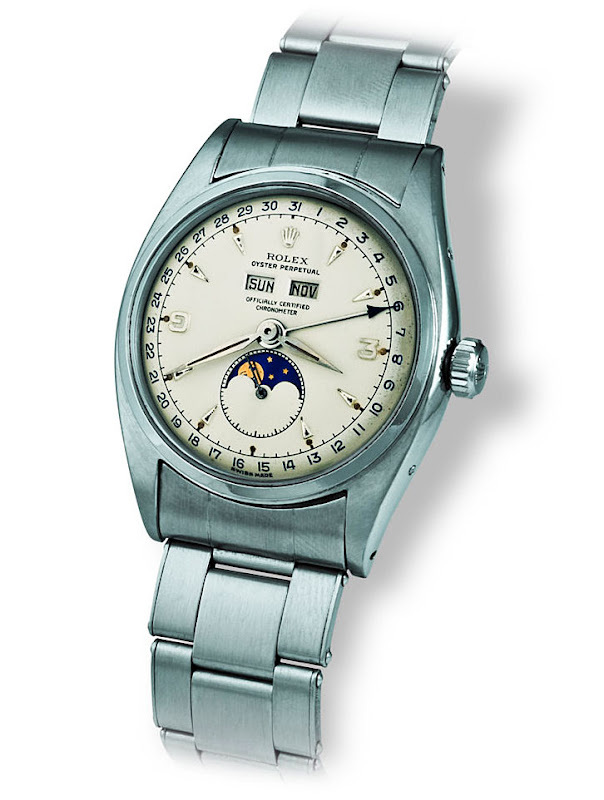 The 6062 Moonphase was 36mm which is the day size as a current Rolex Datejust. I included this watch because it has an unusual braided band and it also has the blue tip on the date hand. The photo of the watch above shows the movement of the watch pictured below. The Centograph is the same as the Zerograph pictured at the beginning of this section on Page 5 with a black dial and strap. 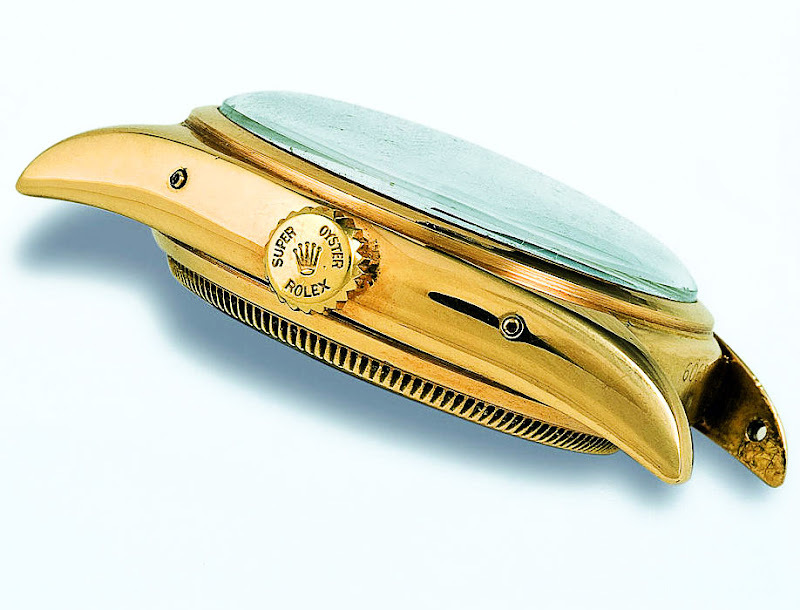 In my mind this beautiful Rolex Oyster Centograph looks in many ways to be a precursor to the Rolex Submariner. 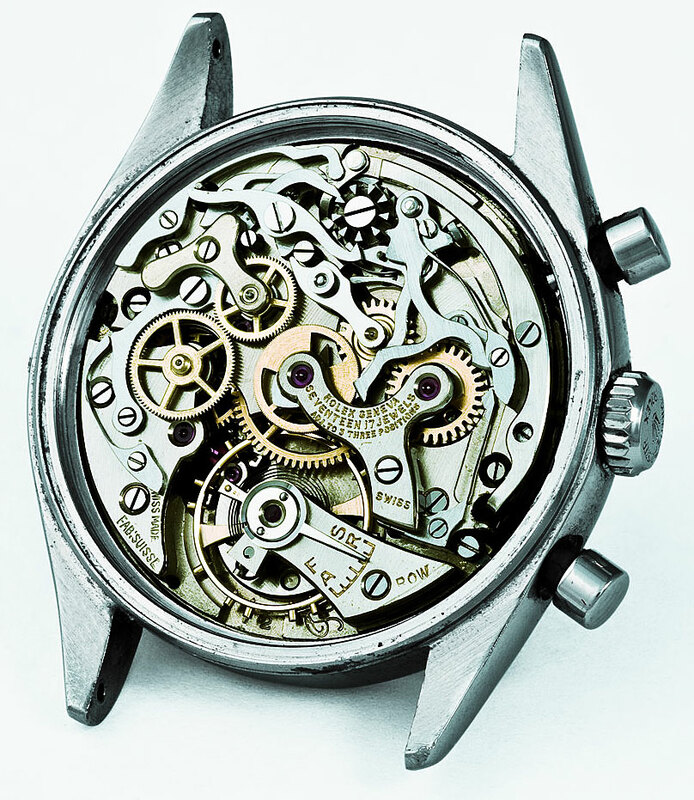 This watch is extremely rare and there are less than 10 known examples on earth. This one is from a collection in Japan. This watch is unusual in many ways, but in particular, the pink gold bezel is soldered to the watch body which is extremely difficult to achieve. This photo of the movement above is of the watch below. The movement is finished in Rodhium and has a monometallic compensation balance with a steel Super Oyster crown. 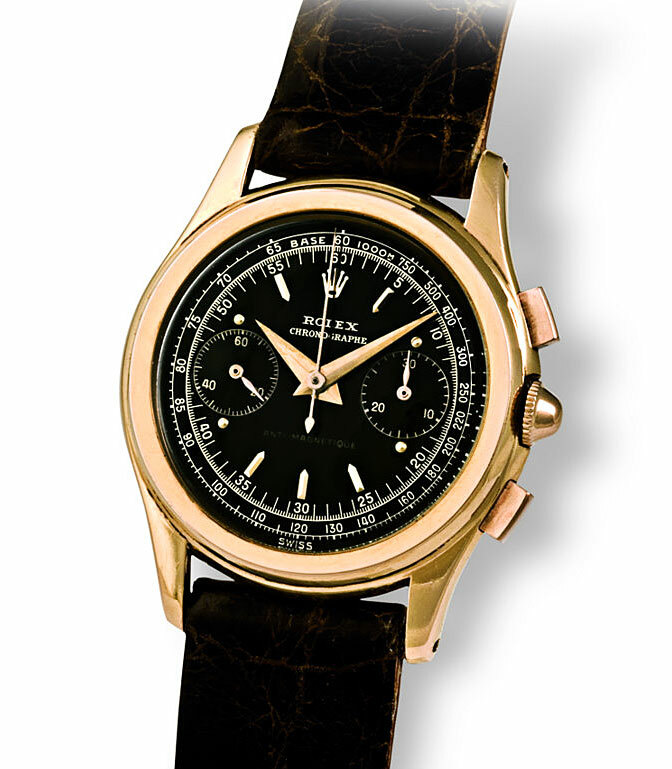 This rare chronograph (pictured above) features a black dial with steel relief dart indices with 1/5 seconds division outer gilt tachymeter and telemeter scales along with Alpha Hands. 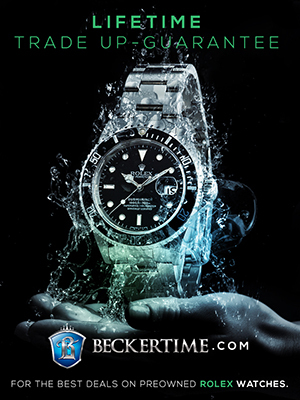 If you click on the photo above you will notice the dial has a strange looking Rolex crown logo that Rolex must have experimented with but they obviously did not like it. 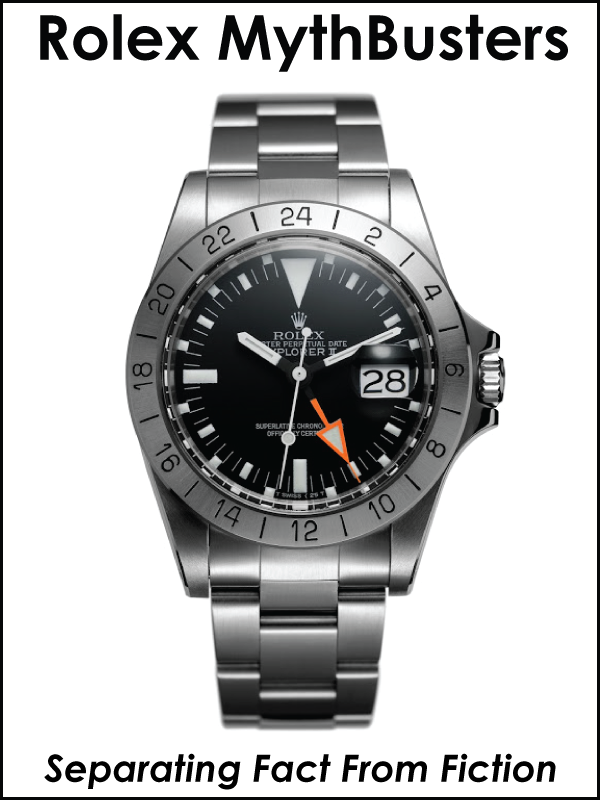 This 36mm beauty is anti-magnetic and has a matte silvered dial with faceted Baton applied indices. It was sold in Caracas, Venezuela by Serpico y Laino. This pink gold beauty is self-winding (automatic) and a waterproof Oyster in a 36mm Super Oyster case. Notice this watch has the luminous 5-minute markers on the sides of the stars apposed to being positioned in the center of the stars like the watch pictured below. In my opinion the Rolex Moonphase pictured above is the most beautiful Rolex watch ever made!!! Black dial star indices moonphase Rolex watches are ultra-rare and this one is not only stunningly gorgeous, but in flawless mint condition. 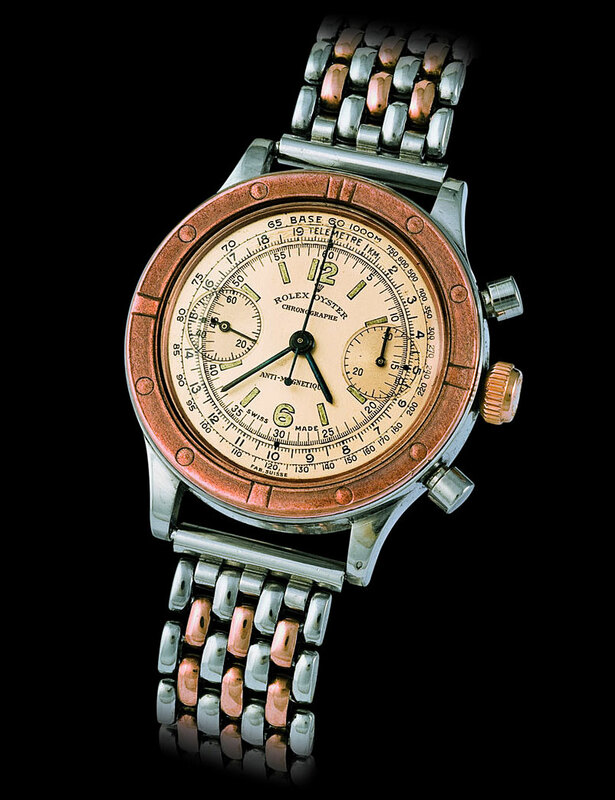 John Goldberger owns many of the watches in his book, but I imagine this must be his favorite. His choice of a tobacco colored leather band is brilliant. 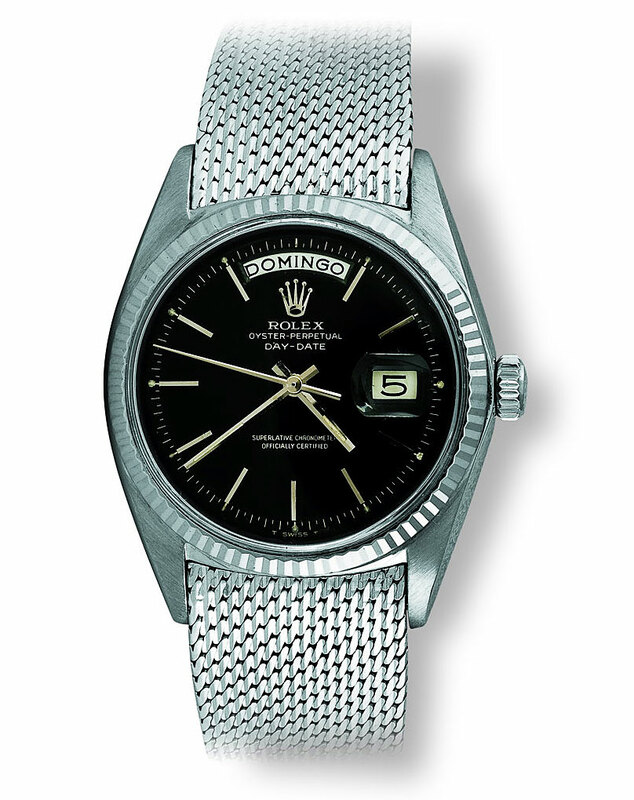 If anybody from the Rolex design department reads this, please, please, please bring back these complicated beauties in 40mm with a flat back. 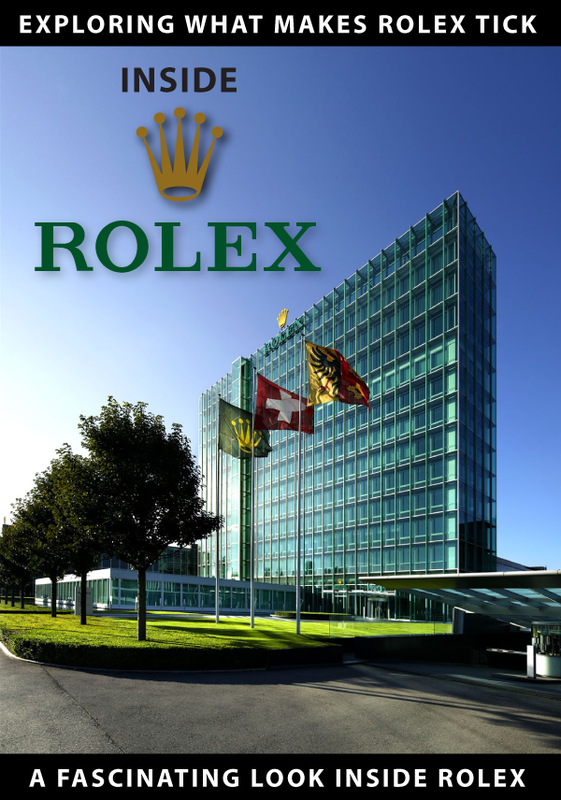 Rolex dominates in sport watches and even brought back the Rolex Prince. 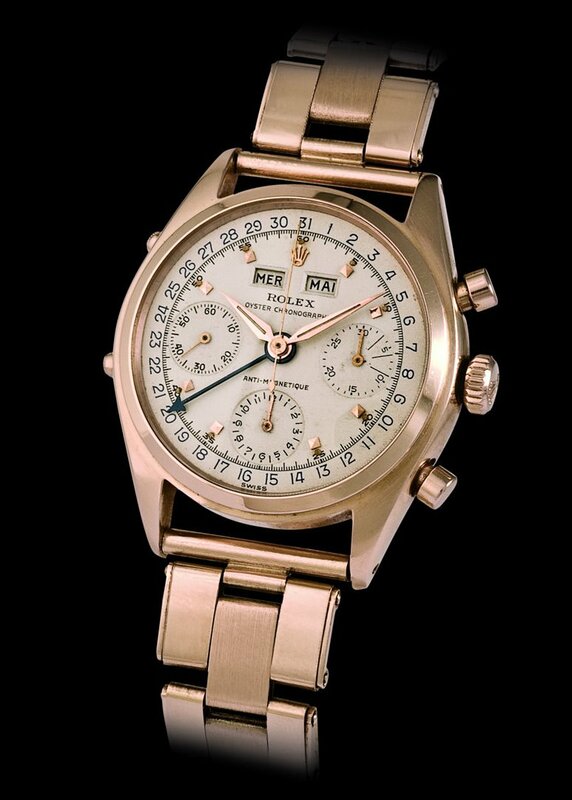 I say it is time to bring back the complicated Rolex watches and give Patek Philippe a run for their money. 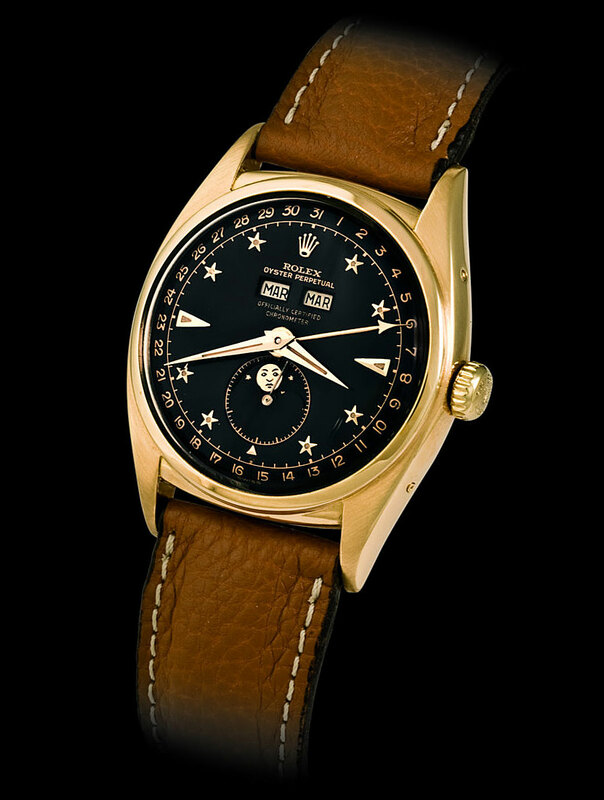 Don't get me wrong, I love Patek, but I think the watch pictured above is the best balanced, most beautiful complicated watch ever made–especially with the star indices. This black beauty has a matching black background on the moonphase disk as do all Rolex Moonphase watches with a black dial. 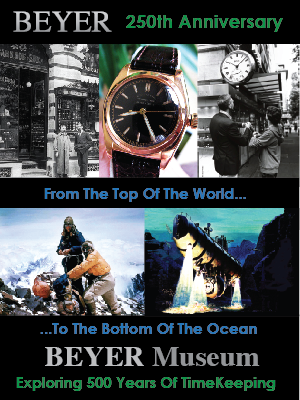 Traditionally all moonphase watches by Rolex and Patek have a blue background for the sky color. All I can say is this watch takes my breath away. 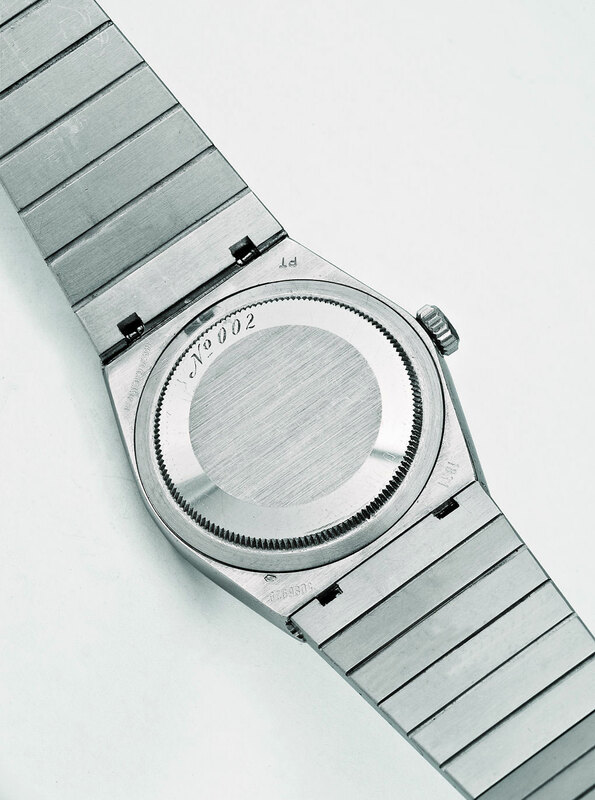 The photo below is of the same watch without a band. It is worth about $400,000. The 6062 Triple date moonphase Rolex is not only stunning from the front but equally gorgeous from the front as you can see below with the domed crystal. Just magnificent!!!!!!!!!!!!!! 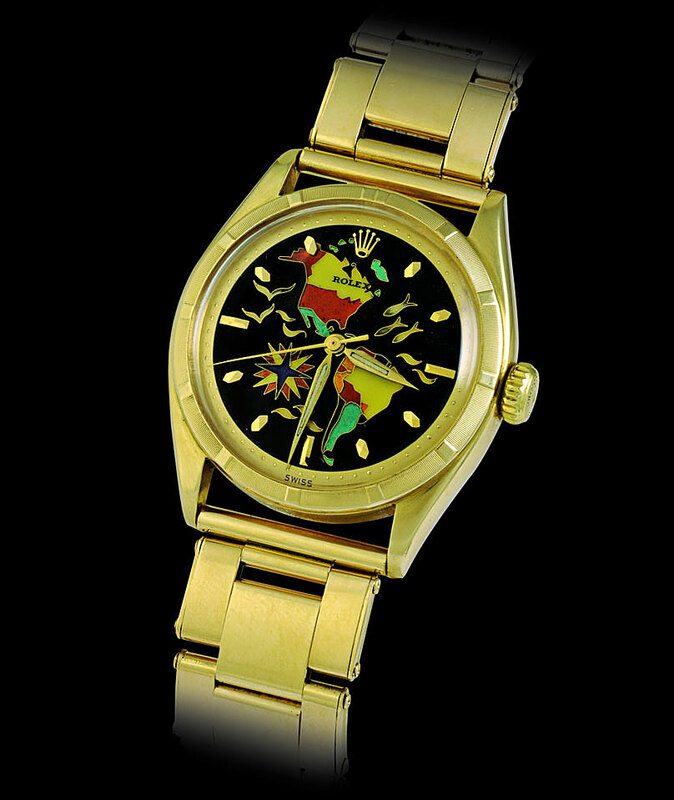 The watch pictured above and below belonged to the last Emperor of Vietnam, Boa Dai. 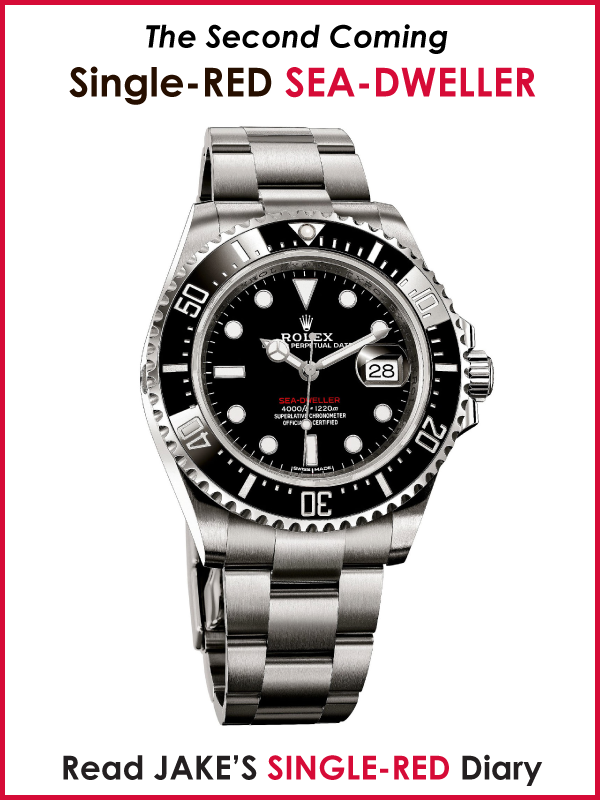 It is unusual because it has a glossy black dial with 5 diamond indices. It also has the Officially Certified Chronometer designation on the moonphase subdial. 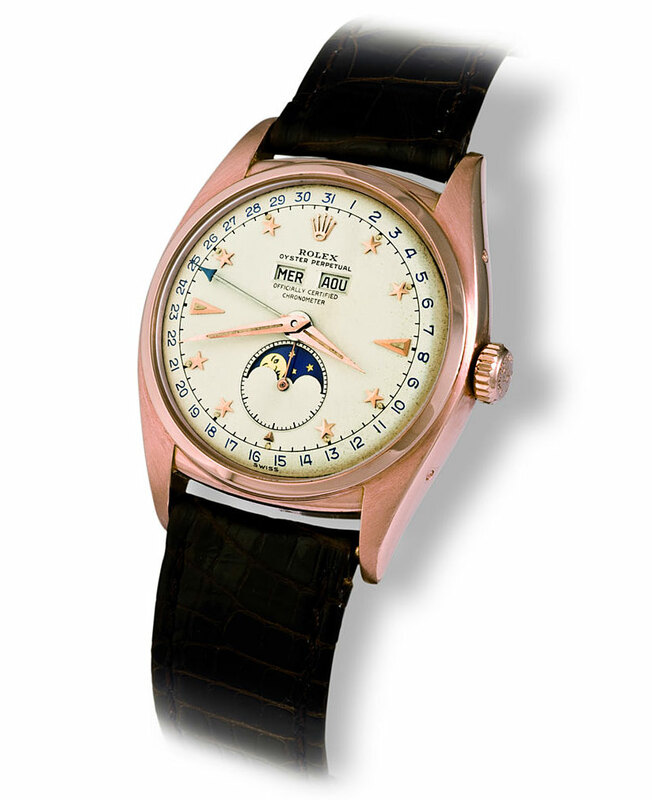 The watch was manufactured in 1952 and sold in 1954 to his Majesty Boa Dai. According to John Goldberger, Boa Dai, the last emperor of Vietnam, was "well known for his fine taste, was a renowned tiger hunter, women lover and car collector. 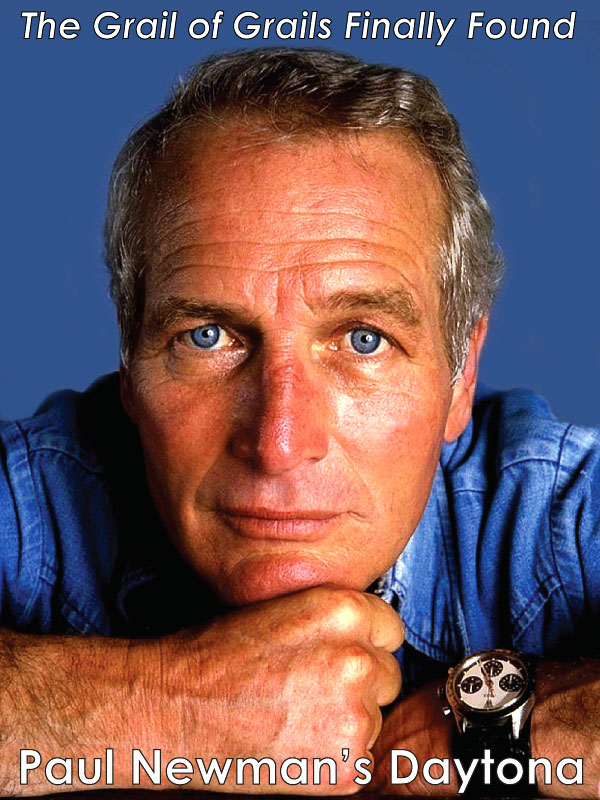 It was during his stay in Geneva for the Indochina peace talks he acquired the 5 diamond Rolex moonphase. 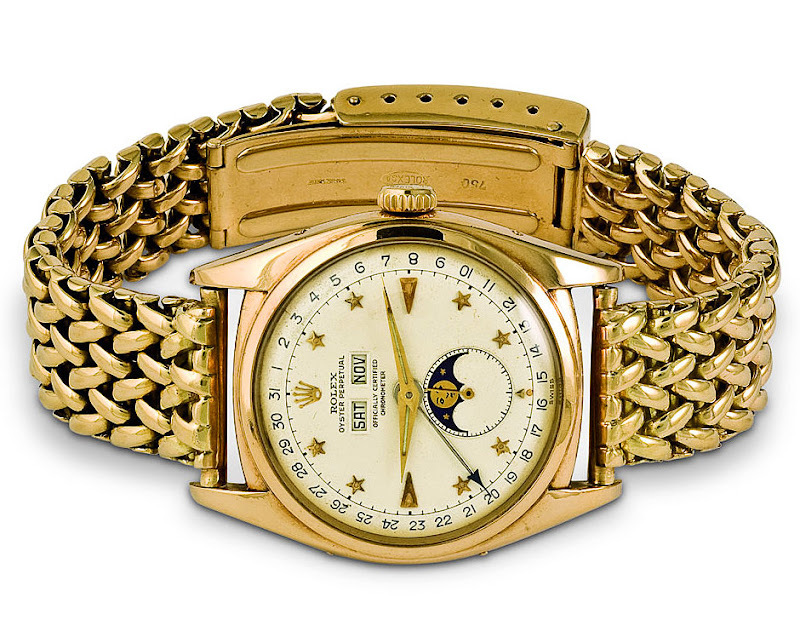 This watch is worth approximately $700,000 and the supreme irony with this watch is that Rolex discontinued the complicated moonphase watches because they did not sell well. 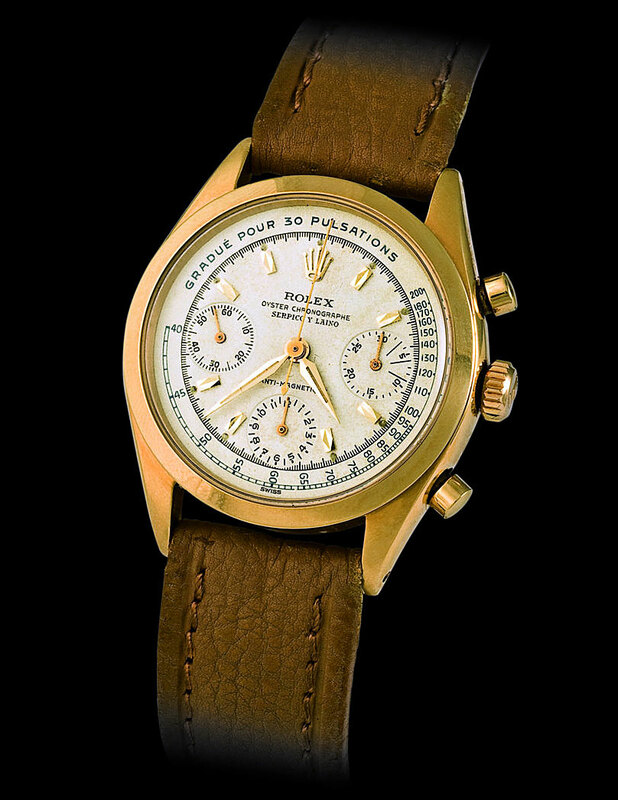 Typically the most expensive Rolex watches are so highly valued because of their rarity which means they are so because they did not sell well at the time of production–sad but true. 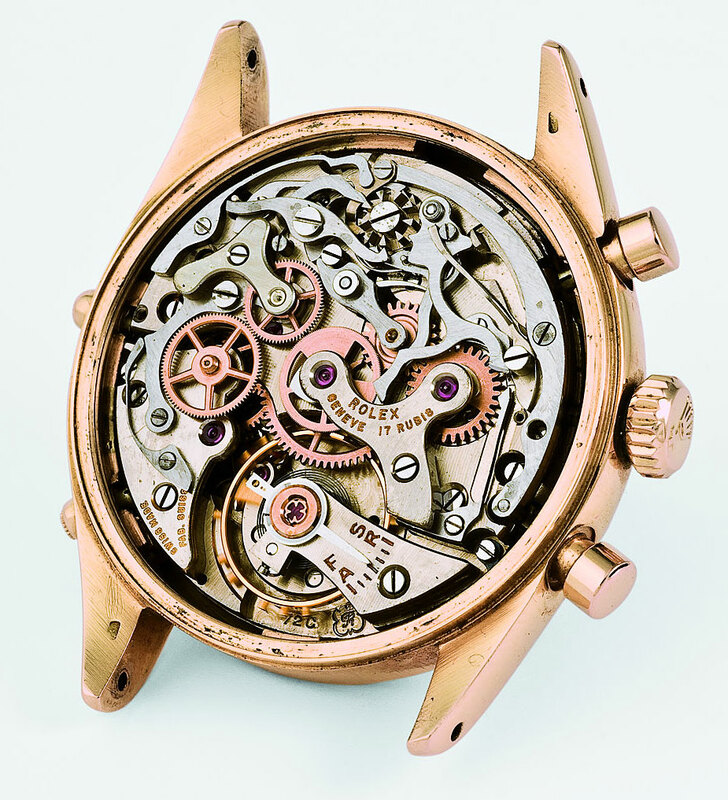 This photo is of the back of the movement of the watch pictured below. 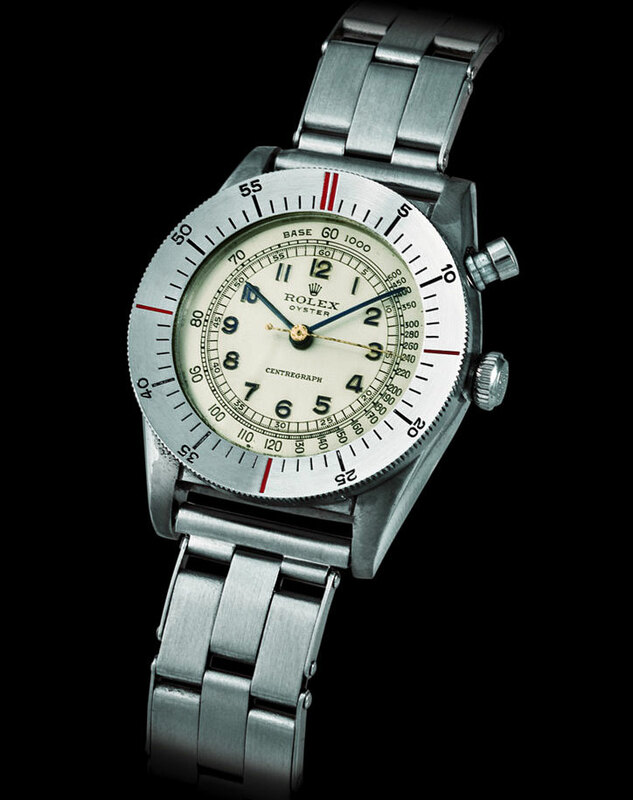 This watch model was dubbed "The Jean Claude Killy" despite the fact that nobody has ever seen a photo of him wearing this Rolex model. 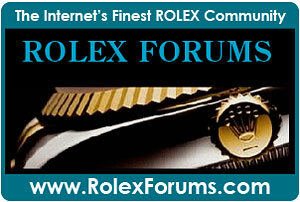 Jean Claude Killy is a three time gold medal winning Olympic skier who occupies a seat on the board of Rolex today. 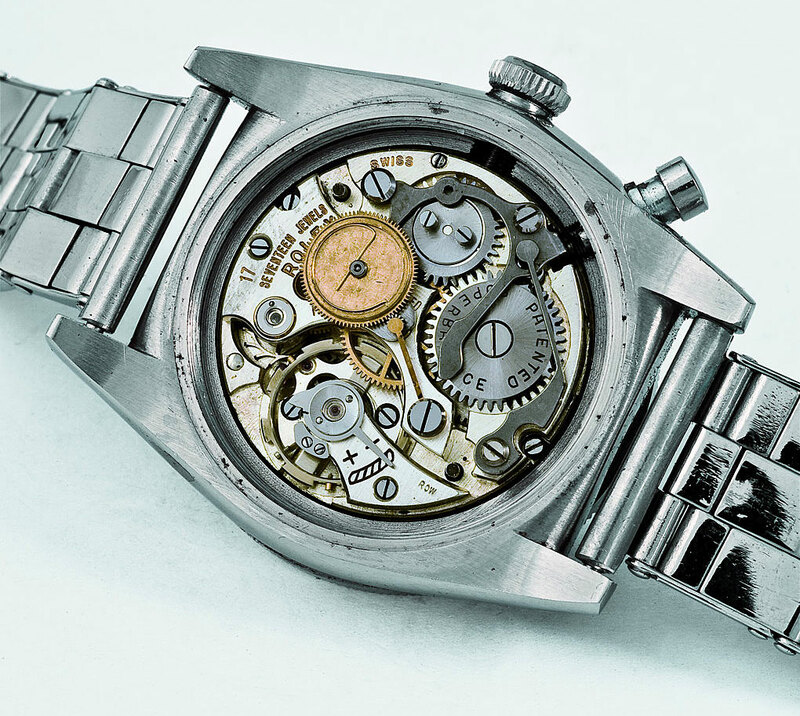 This watch is the most complicated Rolex ever made. 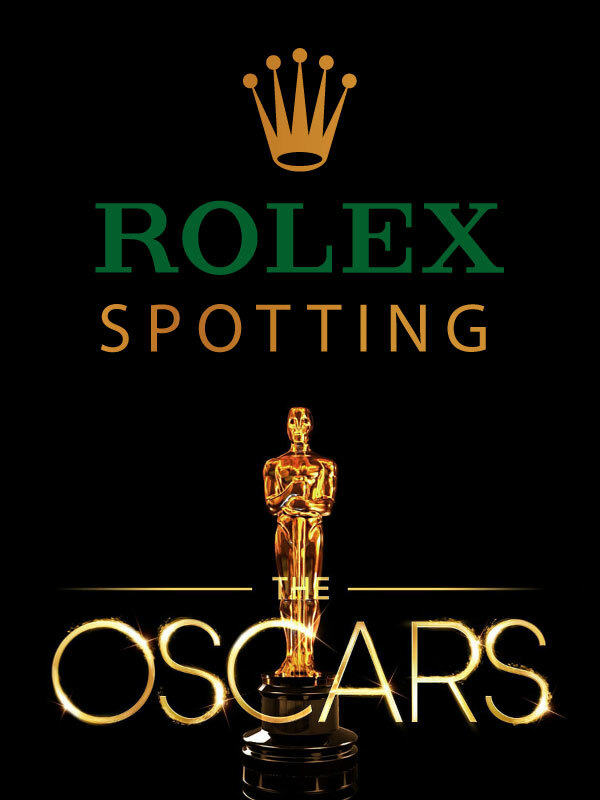 The Rolex Oyster watch pictured above has a silvered dial with pink gold applied pyramidal indices with luminous dots next to them. The outer date ring is in blue and matches the blued steel date hand. The hands of this watch are luminous Alpha hands. Another Jean Claude Killy Rolex Triple date Oyster, this time in stainless Steel. Same blue date ring and date hand. 36mm Tonneau-shaped two-body case with screw back. This watch picture above has no serial number or reference number. It is a very rare prototype Rolex used for internal testing. 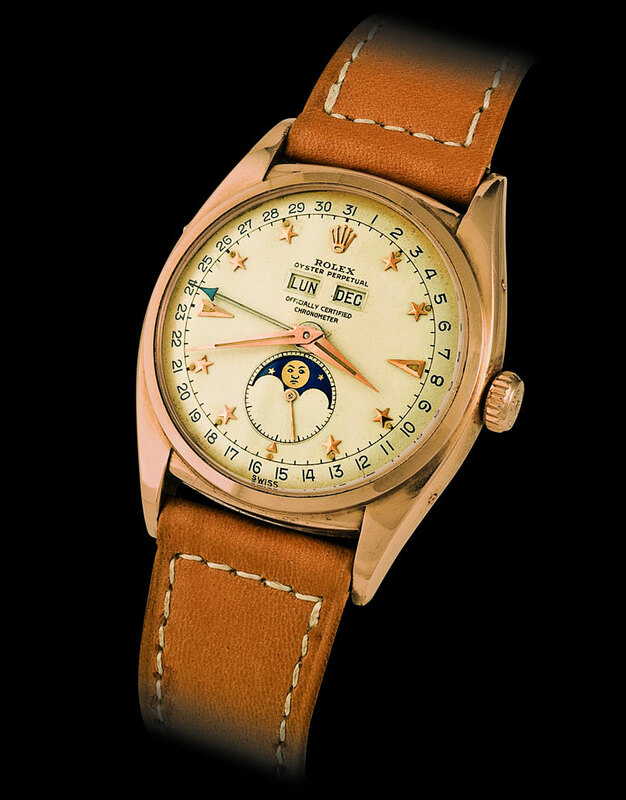 This very early Rolex Day-Date was introduced in the Italian market and thus it has the day of the week wheel in Italian. The date is red as is the Day-Date designation. 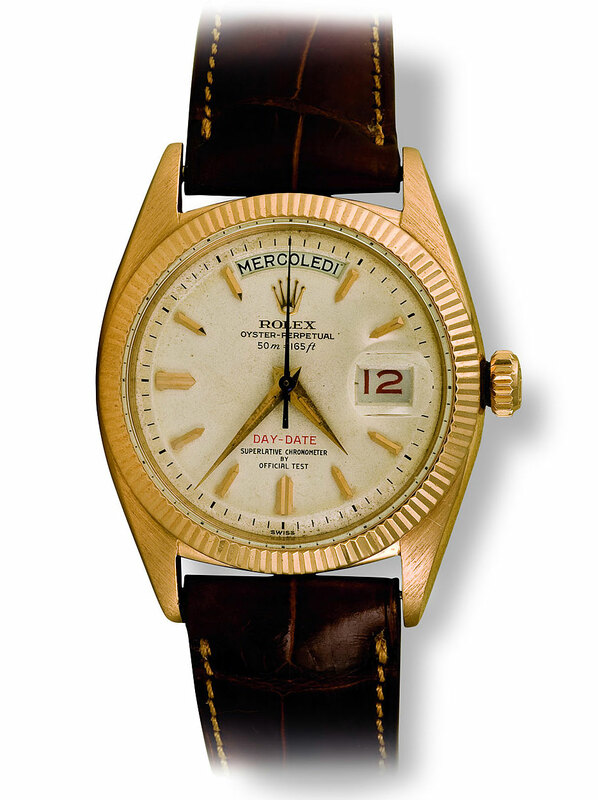 The watch was initially only available on a leather strap and has a fluted yellow gold bezel. 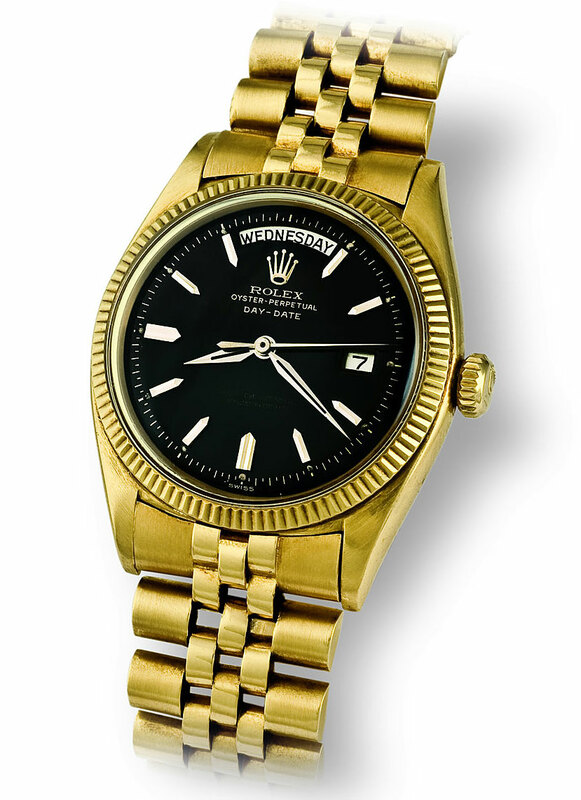 Even though this watch is named the Rolex Day-Date by Rolex, people refer to it as "The Rolex President." 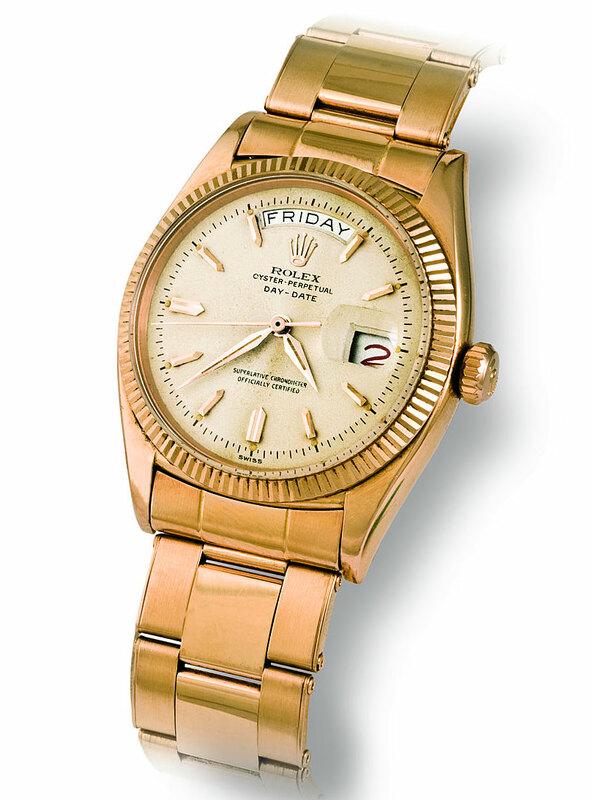 The early Rolex Day-Date watches apparently did not come with the Rolex "President" bracelet as witnessed by this Day-Date on a Jubilee bracelet. 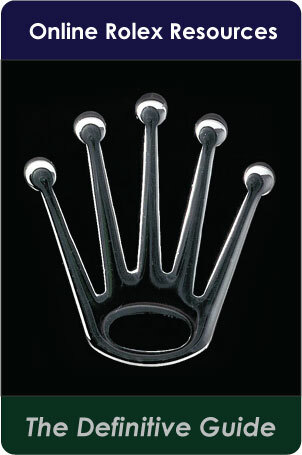 The Jubilee bracelet was introduced on the 40th anniversary of Rolex in 1945. It was named the Jubilee because the 40th anniversary is known as the Ruby Jubilee. 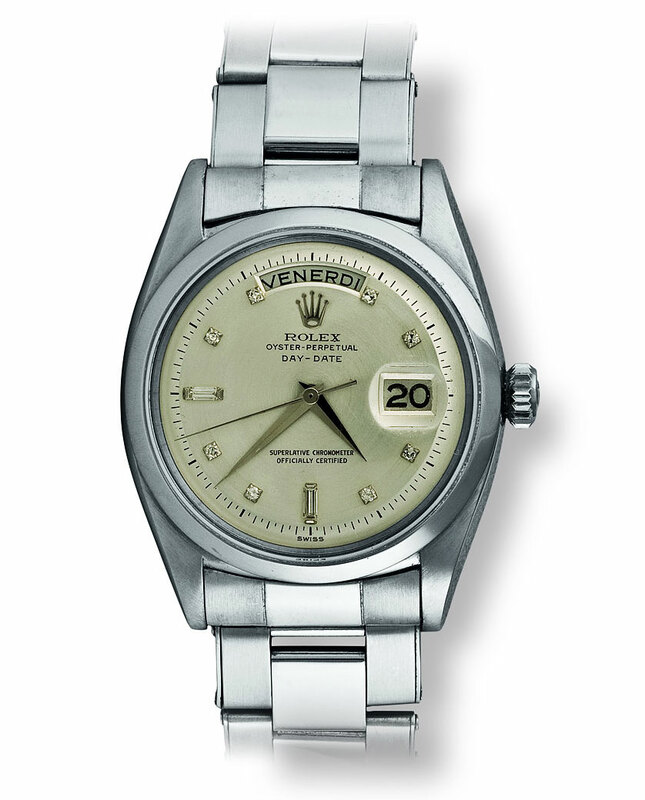 Rolex also introduced the Rolex Datejust in 1945 which was the first watch with a date. 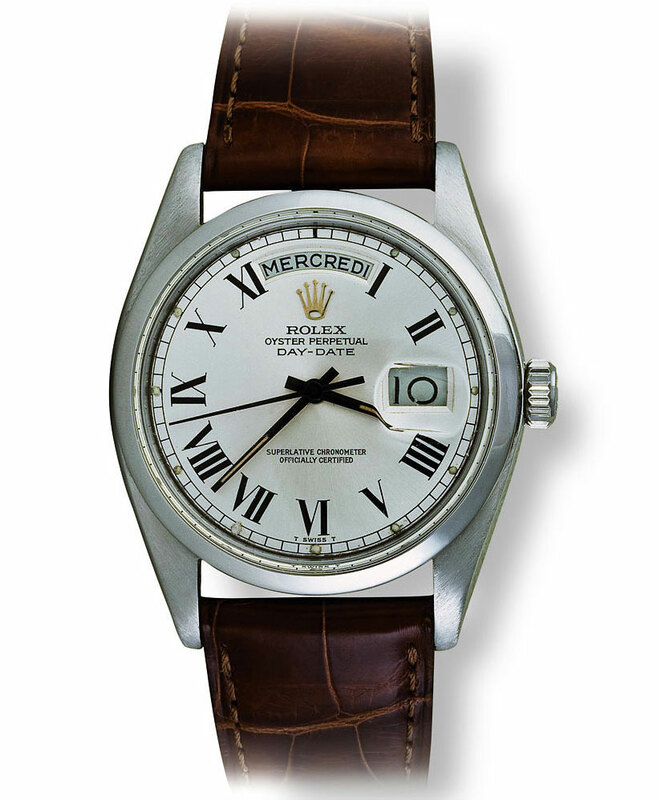 This is another very unusual Rolex Day-Date because it is white gold with a matching white gold Oyster bracelet. The silvered dial has diamond indices and dauphin hands. 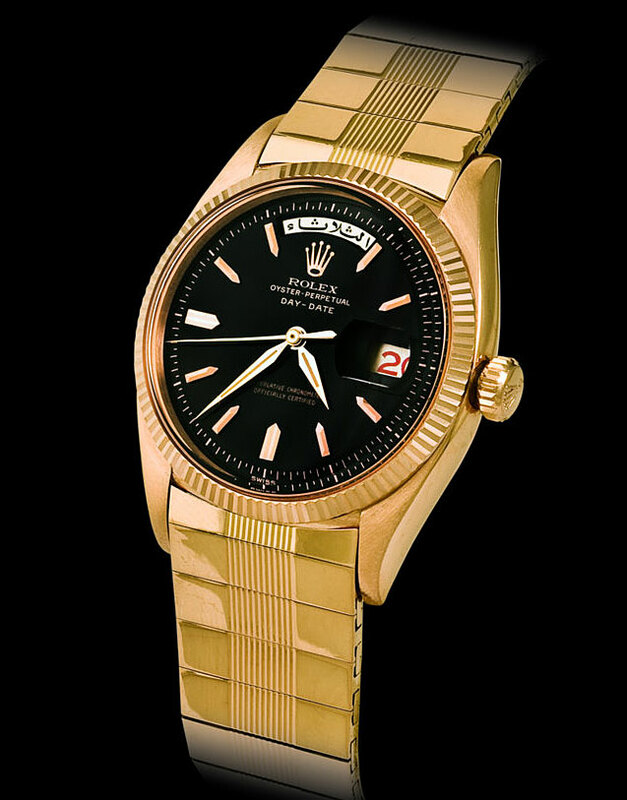 Of course Rolex discontinued the Oyster band option after then introduced the President band, but brought it back many decades later as an option on the Day-Date. It is so interesting and unusual to see these bracelet combinations on the Day-Date. Another very unusual combo. This time a pink gold Rolex Day-Date on a matching pink gold Rolex Oyster bracelet. Notice the date is red. This watch also has a fluted pink gold bezel. 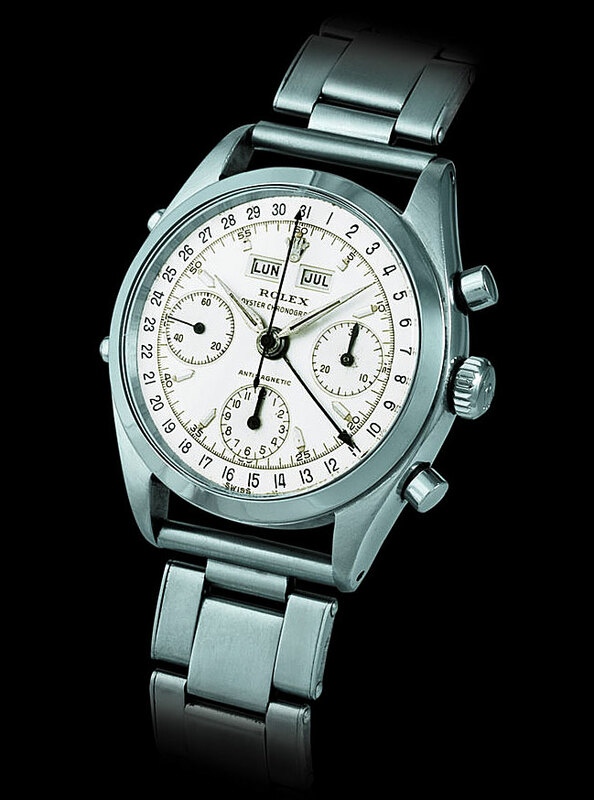 This is yet another example of a white gold Day-Date on an unusual bracelet. This watch watch has baton indices on a black dial. 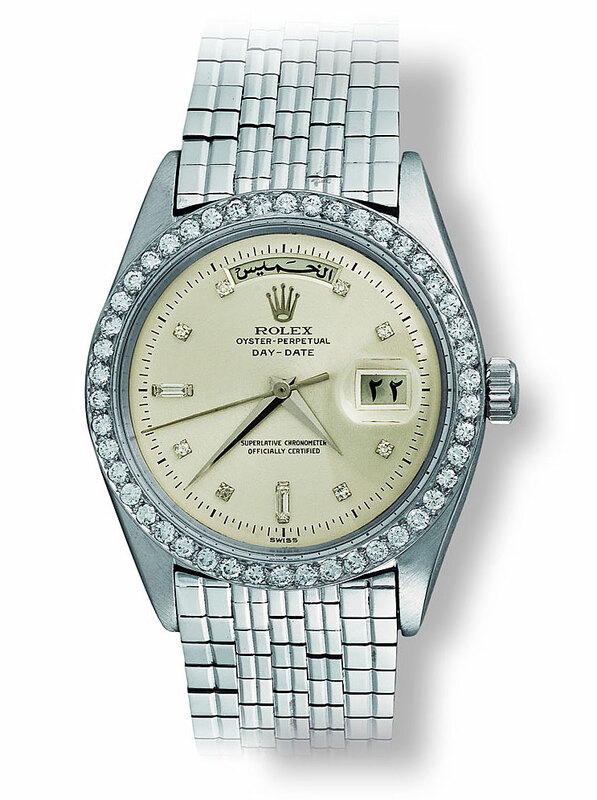 This white gold Rolex Day-Date has a diamond bezel with matching five minute diamond markers and dauphin hands. The day and date wheels are in arabic. 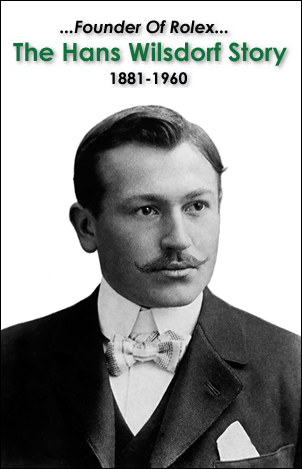 Rolex has always made the Day-Date model in 26 different languages. This Day-Date has another unusual bracelet. This watch also has a day wheel in arabic with a red date wheel with another example of an unusual bracelet. Fluted pink gold bezel with black glossy dial with faceted Baton indices and Alpha hands. The watch with the number 002 on its verso above is a photo of the watch below. 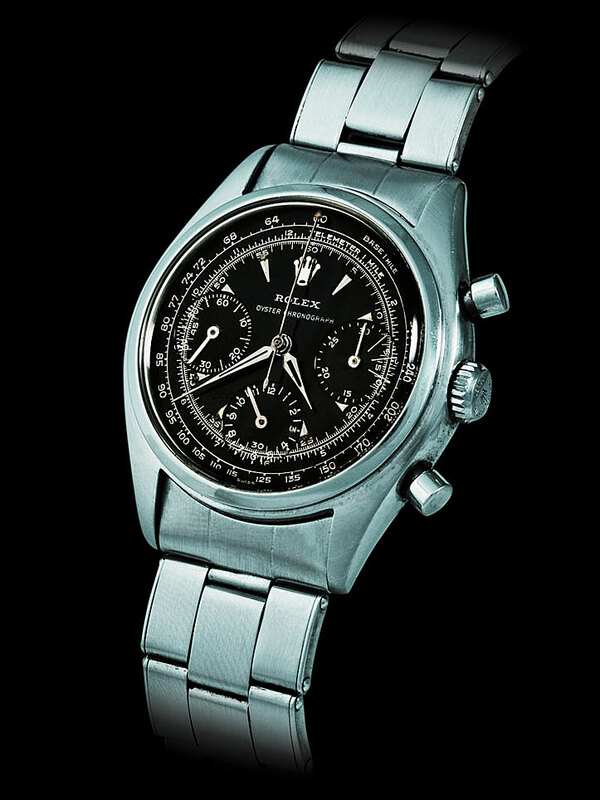 This ultra-rare Rolex Day-Date is made from platinum and is 36mm. It is very heavy and weights 287 grams. 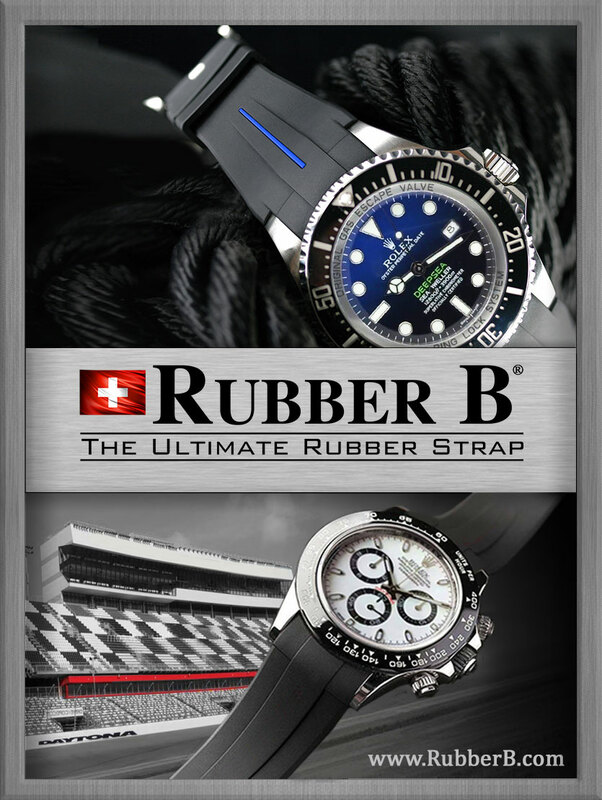 This watch is number 2 of a limited series of only 8 produced. 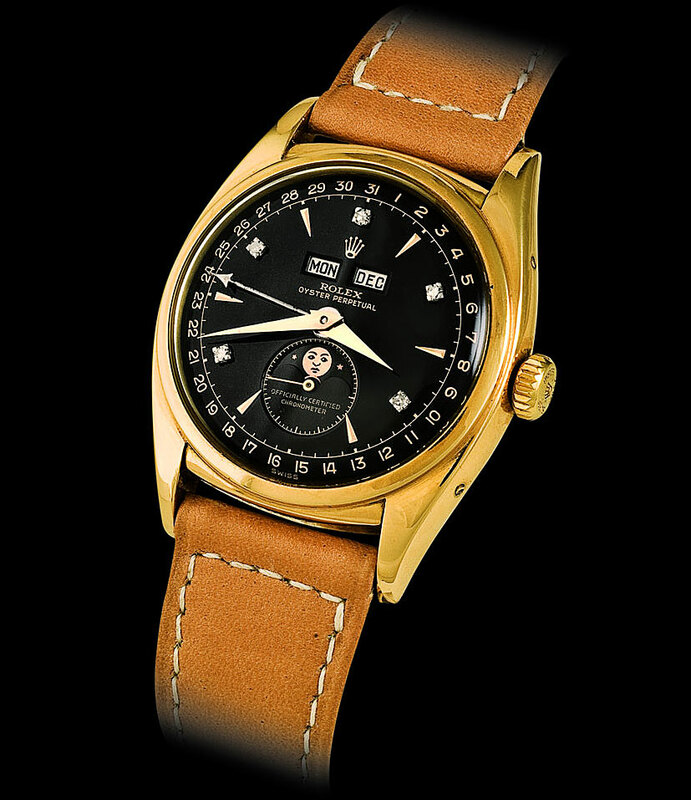 I call this model the King Midas Day-Date because its design language is so derivative of the limited edition King Midas originally produced in 1964. 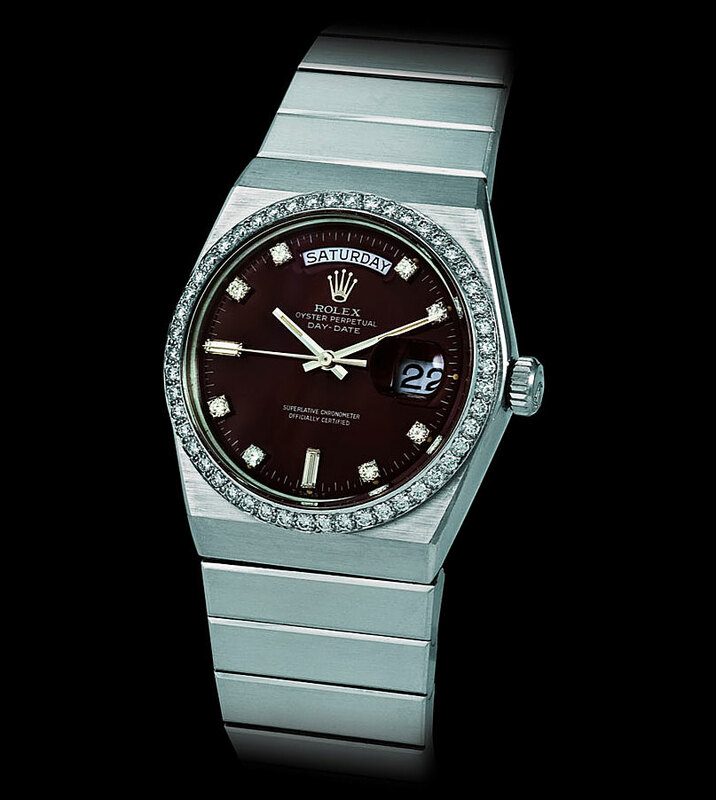 This watch has a deployant clasp with a Bordeaux lacquered dial with diamond indices and a matching diamond bezel. 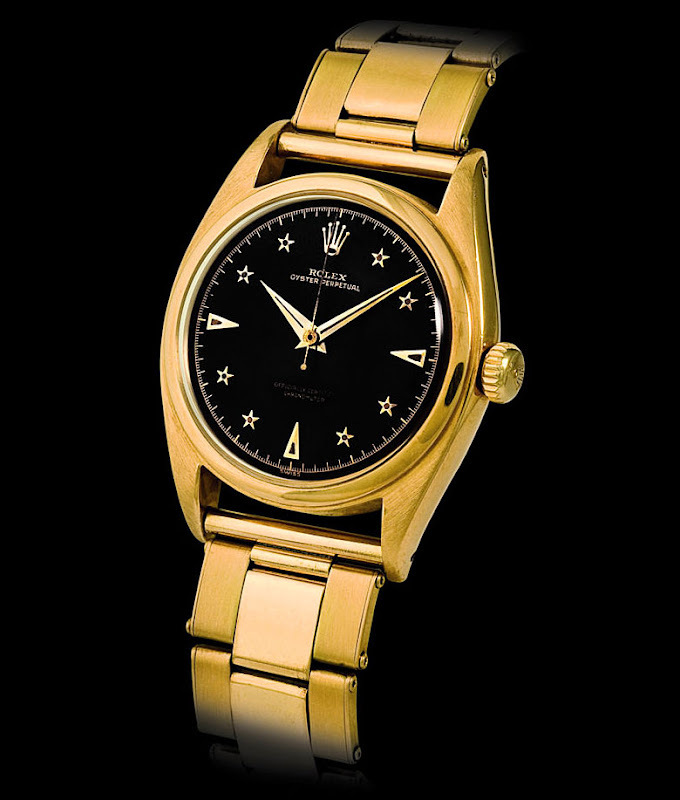 One could also argue this watch incorporates much of the design language from the Rolex Oyster Quartz watches, but understand this is a purely mechanical auto-winding Rolex watch. This watch has a current market value of $100,000.